Ground Penetrating Radar Systems’ Chattanooga, TN office was able to work with a contractor to scan hundreds of feet of a trench line for underground utilities. GPRS uses Non-Destructive testing equipment to locate piping, underground electrical conduits, and other utilities that are unable to be seen. Using GPS we were able to capture all of our findings and create a map of the utilities to the customer. Using GPRS is a safe, cost effective way to make sure you can safety dig or trench without cutting into utilities. Other services we offer are; Underground utility location, Conduit Locating, Underground storage tank location, Void Location and more. 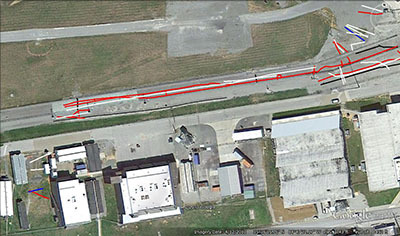 If GPR services are needed in East Tennessee call Dave Schaff at (423) 667-0456 or email at dave.schaff@gp-radar.com.